Labor Day. Time to stow away the white patent leathers and searsucker suits, at least according to The Rules that we follow here in the South. 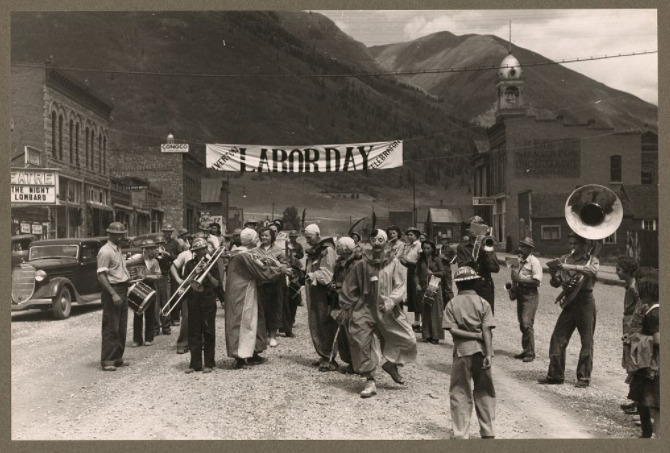 Of course, since Labor Day represents a lot more than a wardrobe schedule checkpoint, we just had to check out some of the history behind it. So what do you know about the workingman's holiday? 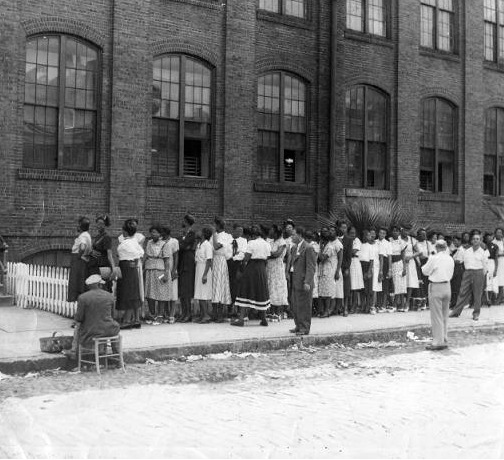 Strikers outside of the Cigar Factory in Charleston, SC, ca 1945. From Lowcountry History Digital Initiative. On October 22, 1945 over 1,200 workers at Charleston's Cigar Factory on East Bay Street went on strike against the American Tobacco Company. Most of the strikers were black women (who made up the majority of the factory's workforce) but there were also white women and men of both races involved. It was a remarkable time in history, when typically segregated groups came together in solidarity to fight for the rights of all workers. The strike lasted five months, and while many of the strikers' demands were not met, it was nonetheless considered a modest success. Now here's something you might not know about: A long-time Cigar Factory worker named Lucille Simmons changed the words of the old spiritual "I Will Overcome One Day" to "We Will Overcome" and used it to signal the end of the day for the picketing strikers. A couple of years later at an activist workshop in Tennessee, the song was spread. Eventually it was recorded by Pete Seeger as "We Shall Overcome" and became the anthem of the Civil Rights movement across the country. Way to go, Ms. Simmons! 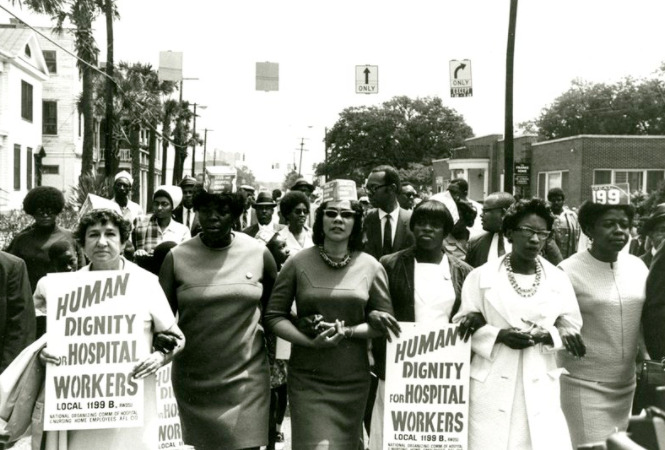 Coretta Scott King (center) with hospital strikers, Charleston, SC 1969, courtesy of Avery Research Center via the Lowcountry Digital Research Initiative. Despite the united front displayed by Cigar Factory workers, by the 1960s labor disputes were closely aligned with civil rights violations. In Charleston, early efforts in addressing civil rights by desegregating schools and businesses had not been extended to workers by the end of the decade. Hospital workers at the Medical College and County hospitals began organizing over a year before they formally asked for anti-discrimination measures, fair grievances policies, and union recognition. The Medical College's president refused to hear their grievances, so on March 19, 1969 the Charleston Hospital Workers Strike began. State and county officials were determined to not to recognize a workers union at any cost. While Mayor J. Palmer Gaillard and some hospital officials were willing to begin a dialogue with the strikers, Governor McNair refused to let that happen. On April 25, he ordered over a thousand state troopers and National Guardsmen to Charleston. A state of emergency was declared and a curfew imposed. There were protests and demonstrations and hundreds of arrests. As summer approached, things got heated up. Coretta Scott King came and spoke, lamenting the $1.30/hr wage that black nurses were making. 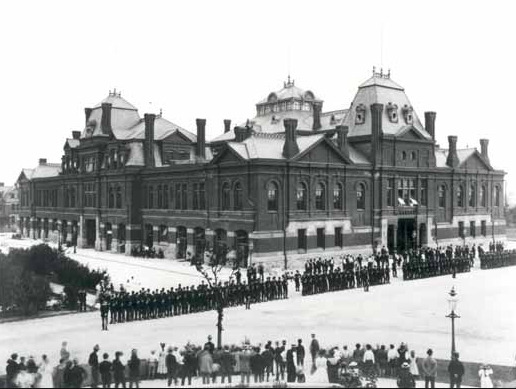 There was a parade on Mother's Day in which 10,000 people (including five US Congressmen) marched from the City Hall Auditorium on upper King Street to the Medical College on Ashley. There was a boycott on King Street businesses, and demonstrations marched through the City Market, which was beginning its tourism season. Things were getting crazy, and the pressure was on--for everyone--to find a resolution. On June 27, 1969 the Medical College president announced that an agreement had been reached. The strikers were hired back with a modest pay increase and a new plan for hearing grievances was put into place; the strikers conceded on the union recognition. Organizers declared it a victory for 25,000 hospital workers--black and white--across the state. Perhaps the greatest legacy of this three-month strike is that state and local leaders were awakened to the voice of the everyday worker. And that's exactly who Labor Day was created to celebrate.